The first 10 tips are about preparation, that is – preparing your track for the final mixdown, which leads to my first point. Separating the creative/musical and creative/technical side can be incredibly helpful, not only in terms of workflow but also production quality as a whole. You know the saying – you can’t polish a turd. Note: it starts at an even more fundamental level than this – composition. If your songwriting isn’t good, using great samples isn’t going to make your track enjoyable. Before mixing, take a listen through your track a few times and make sure you’re happy with the arrangement and everything else (you don’t have to be completely happy with how it sounds sonically, as you’ll be fixing that in the mixdown). Labelling and coloring tracks speeds up workflow big time. Our brain responds to color faster than it does to words. I typically color all my drums and percussion yellow, bass blue, and synths green. Grouping similar tracks can help you to achieve a more ‘unified’ sound through bus compression, EQ, reverb, and whatever else. As far as I’m concerned, our ears don’t perform at 100% the whole time we’re awake. If you’re listening to music all day, or working in a place with loud noises – then mixing down after that means you’re doing your music a disservice. It’s a lot easier to find balance by pulling the fader up from nothing. You might want to do this after the preparation stage, I like to do it during. Don’t overestimate your abilities. Use reference tracks. Work out what this is and start with it, use it as a reference point and build all other elements around it. I typically start with the kick. Any time I add an element that causes the kick to lose punch I know I need to adjust the new element. It takes time! Mixing down a track does not involve slapping a limiter on top and uploading it to Soundcloud saying “plz download,” it involves effort, hard work, and time. If you know that you’re heading out in 30 minutes, then it’s probably not the best time to start a mixdown. Find a time where you can commit a couple of hours solely to mixing. If the low-end is too loud, then fix it! If you’ve got a harsh high-end, fix it! Don’t procrastinate and convince yourself that mastering will fix it. Understand that I have no hate towards third party plugins, there’s no denying that they do sound better – but a new plugin will not make your mixdown sound significantly better if you don’t know how to use the tools first. If you’re unaware of how a compressor works, then why would you buy (or acquire) a different one? Save money and learn first. Whether it’s VST’s, your DAW, or your monitoring environment – don’t make excuses.Good tools help a lot, but they aren’t required. The most important thing is that you know your gear inside and out. Honestly, you’d be surprised at how often I see this. It’s completely stupid, listen to a song with a beanie on and take it off halfway through and ask yourself whether there’s a difference. Wearing something over your ears blocks out a lot of high-frequencies and is horrible for mixing and making music in general. At the end of the day, most of us are using digital instruments, meaning that we’re not really recording anything that has high dynamic range. If Noisia boost their snares at 150Hz, it doesn’t mean you should start doing it in every mix. I’ll talk more about breaks in the workflow section, but after mixing for long hours at a time it’s important to take a long break (30-60 minutes or more) to completely recalibrate your ears so you can start fresh afterwards. One thing I like to do is get my mix sounding good with minimal automation, and then leverage automation to make it sound excellent. The reason for this is that automation can be a big distraction, it’s a time-consuming process. So try to automate things after your basic mixdown. You may find that you run into some problems after adding automation, so you’ll have to fix them up at the end. If it sounds good, leave it! There are no rules, only guidelines. Just don’t do the opposite. Guidelines are helpful, people shouldn’t despise them. Of course they can be avoided, but if someone tells you that you should keep your sub-bass in mono – don’t be a hipster and stick it in stereo. Above the 200Hz range you can be a little less careful, but anything below that is going to cause issues when it overlaps too much. If you finish a mixdown, wait until the morning and listen to it with a pair of fresh ears. I know this is hard, as we all want to share our art with the world – but it’s better to be safe than sorry. Embracing the fact that some things aren’t going to work, and knowing how to deal with them will increase your workflow tenfold. If you know that two elements just aren’t going to work together no matter what, then deleting one can save you hours of hassle and stress. I know it’s horrendously boring to do so, but knowing your shortcuts will save you A LOT of time. Also, save frequently. I like to save after spending a bit of time on an effect or section of the song. There’s nothing worse that your PC or DAW crashing and losing everything you’ve done. Like I said earlier in the article – you should devote time to this. Not heaps, but enough. Because of this, it helps to be comfortable. Despite all this workflow and productivity advice, I must recommend not to rush the mixdown – which can be easy. I can’t give any tips for this, because it’s up to YOU to find the perfect balance. 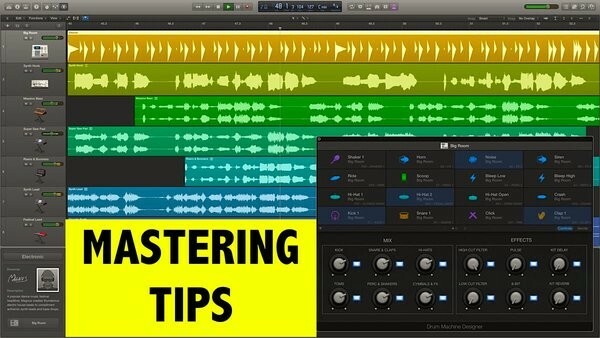 The last 5 tips include what I’ve personally done, and what I recommend to take your mixing to the next level. Whether you’re a beginner or intermediate, this should help you out. This might sting a bit, but it’s far better than someone saying, “Yeah it sounds nice bro.” Because that’s not going to help you improve. If you’re a solo-producer then you’ll know that it’s easy to get stuck in your ways. You might have a lot of bad habits that haven’t come to light because you haven’t seen anyone else work.